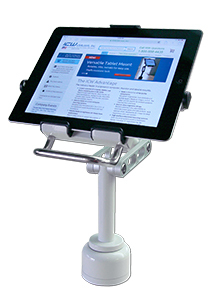 Theft Resistant desk mount requires custom ICW key for tablet removal. Clamp mount. Does not include theft resistant fastener. Mounting plate only. Does not include stand. The tablet rotates 360º and tilts to any viewing angle. Rotates easily from portrait to landscape mode.